Faster and cheaper than a plumber! Our high pressure system can clean drains up to 450mm in diameter. Most plumbers can only handle 90mm pipes! Our system can remove build up of grease, tree roots and other items that block drains ; quickly and with far less expense than digging! Over time the build up of sediment, fats, grease and debris can form and settle in structural imperfections of sewer and storm water pipelines. The advantages of water jetting over other cleaning methods such as rodding are rather then just breaking through the source of the blockage the actions of high velocity water jets at pressures of up to 2000 PSI flush away debris restoring the pipe to full capacity. Aqua-Blast carries a range of nozzles suitable for both domestic and industrial applications. The use of precision jets of water break down fat and grease build up allowing disposal through normal flow. 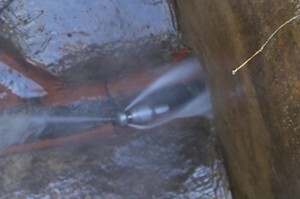 High Pressure water cleaning is also suitable for removal of sand and building debris from storm water drains. The following video shows a USB Grand Slam Nozzle – 3D in action. The Nozzle is clearing a 300mm pipe of built up silt and rubble. The video was taken with a GoPro Hero 3. Note the sound of the silt and stones hitting the GoPro at 2000PSI+. The effect was equivalent to sandblasting the casing, leaving the lens cover pitted and unusable!